With the trade war between the world’s two largest economies in full swing, a number of international brands are shifting production away from China, with Cambodia a strong contender to become their next base for the manufacturing of garments and footwear products. Local firms will be able to promote their products to local and foreign buyers at the Import-Export Product Exhibition, which will take place in December in the nation’s capital. Cambodia Airways held a press conference in Taipei on Tuesday (Sep 11) to announce that it will launch two weekly Siem Reap-Taipei charter flights on October 9, according to a Liberty Times report. The United States urged Cambodia’s government on Tuesday to drop all charges against opposition leader Kem Sokha, who was released on bail but has been placed under house arrest. Keisuke Honda’s first match as general manager of Cambodia’s national team ended in a 3-1 loss to Malaysia in an international friendly on Monday. Following July’s massive victory in unfree and unfair elections, Cambodian Prime Minister Hun Sen, whose ruling party took every seat in the lower house, appears to be adopting a time-tested strategy he has used repeatedly in the past. A heartbroken mum is desperately raising money to fly her son back to her Fylde coast home after he had a stroke which left him fighting for his life. The largest banana investment company in Cambodia, Longmate Agriculture Co Ltd, planned to export yellow banana to the Chinese market in early 2019. 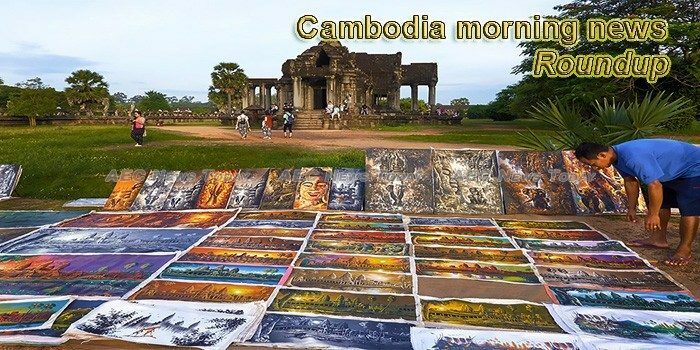 Within the first eight months of 2018, the Cambodian government had collected about 6,013 billion Riels ($1,503.3 million) tax revenue, an increase of 12.58% compared to the same period last year, according to the report from the General Department of Taxation (GDT) released on Monday. In the first eight months of 2018, at least 22 Cambodian capital-provinces were affected by flood and that 44 people passed away, according to Nhem Vannda, Executive Chairman of National Committee for Disaster Management on Monday. The dengue fever cases for the first six months this year increased to more than 70 percent compared to the same period last year, a report said. Anlong Veng district authorities in Oddar Meanchey province are looking into a land dispute in Lomtong commune’s Lomtong Chas village after 12 families alleged that a two-star military general had threatened to set their houses ablaze if they refused to cede their land to him. Four days after the creation of the new government, Prime Minister Hun Sen left Cambodia on Monday for the 15th China-Asean Expo in Nanning city and an Asean meeting in Vietnamese capital Hanoi. Representatives of eight major Chinese companies paid a courtesy call on Prime Minister Samdech Akka Moha Sena Padei Techo Hun Sen of the Kingdom of Cambodia, in Nanning, China’s Guangxi province this afternoon, on the sidelines of the 15th ASEAN-China Expo.